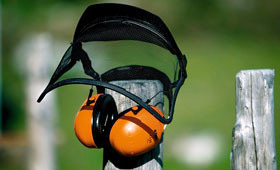 Eyes and ears are in particular need of protection when using power tools. STIHL's individually adjustable combined face and ear protection has proven itself in this area. Ear protection reduces engine noise. face protection keeps flying debris, such as grass and twigs and dust, away from your face.